Learn to ski or snowboard this winter at Mont Ste-Marie! Can you think of a better place to nurture your child’s natural curiosity and love of the outdoors? MSM offers the best ski and snowboard lessons around. Prioritizing safety and a love for the mountain is our number one priority! Skiing with a twist or maybe two! Students must be able to ski or snowboard on “Blue” runs. Maximum 8 kids per class. Minimum of 4 in each program! No switching days of program once started! For beginner skiers ages 7 to 12. Must be able to snowplow unassisted. Maximum of 3 students per instructor! No switching days once program starts. Get your 3, 4, or 5-year-old skiing in our NEW Mini Max 1 program. Starts: January 12th or 13th and February 9th or 10th 2019 for 4 Saturdays or Sundays. Get your 4, 5 and 6-year-olds skiing in our Mini Max program. Must be able to snowplow confidently! Maximum 3 children per class. Starts: January 12th, 2019 for 8 Saturdays or Sundays. Schedule: 10 am to 12 pm or 1 pm to 3 pm. Mont Ste-Marie offers a 5-day Christmas program for children of all ski ability levels (no snowboard lessons). Nancy Greene Christmas Camp: 6 – 13 years old able to meet the Nancy Greene skiing criteria, ratio of 6:1 for 3 hours/day Cost: $225 plus lift ticket. Schedule: 10 am to noon, 1 pm to 2 p.m.
Do you want to be part of the coolest programs around? SX and Boarder Cross are now Alpine Olympic and World Cup events. These are some of the most exciting venues on snow. MSM Snow School offers a one-day and two-day Ski Cross and Boarder Cross program. The program focuses on technical and GS skiing/boarding and race discipline. The athletes will have the chance to complete in open events which will be hosted at Mont Ste-Marie. Cost: $435.00 ($615.00 with 5-day Christmas Camp, Dec 27-31). Lift ticket extra. Cost: $715.00 ($895.00 with 5-day Christmas Camp, Dec 27-31). Lift ticket extra. * Snowboard Cross must have a minimum of 6 registered athletes. The Nancy Greene program is MSM’s entry-level race program, designed to develop FUN-damental skiing skills and self-confidence. The program is open to skiers aged 6 to 13 years old (as of December 31st). Nancy Greene instruction emphasizes safety, FUN, fair play and entry level technical skiing skills with a focus on racing and tactical race skills. All Nancy Greene Athletes must be able to ski unassisted. Race approved (hard ear) helmets required. Races throughout the Outaouais Zone are organized to give kids an opportunity to test their newly acquired skills in a fun atmosphere, while developing confidence and teamwork and sportsmanship. Nancy Greene races are scored as “team” events, avoiding the imposition of individual competitive pressure at too young an age. Introduction to ski racing. No home or away races. Schedule: 9:30 am to noon and 1 pm to 2:30 pm. Cost: $410.00 / With Christmas Camp (Dec.27 to 31) $635.00. Lift tickets extra. This program offers 2 days of skiing/racing and a ski camp between Christmas and New Year’s. Cost: Weekends only $720.00 / with Christmas Camp $920.00. Lift tickets extra. *Additional fees (TBD) are payable to Club Mont Ste Marie for race participation. Subject to the scheduled date of the last race (TBD for 2019), the program for race participants may be extended beyond 9 weeks. Please note that we require a minimum of 5 children per class to run this program! Please note that we require a minimum of 3 children per class to run this program! An excellent introduction to the wonderful sports of skiing and snowboarding. You’ll never look at winter the same again! First-time skiers/boarders are given a 2-hour group lesson teaching ski/board basics. Includes: Lift pass and equipment rental. NB: Board is half-day rental only. Lesson starts at 10:15 a.m. Check in time is 9:15am! Children must be 12 years of age and older. If only one participant, lesson reduced to one hour. Limit of one session per person. Reservation and payment are required 24 hours in advance. No refunds! Cancellation must be a minimum of 24 hours notice to reschedule, based on availability. This is an excellent opportunity to spend some 1-on-1 time with some of the best ski professionals in the region. There’s nothing like a private lesson to help you develop your skiing and snowboarding abilities. Private lessons are offered hourly. Reservation and payment are required 24 hours in advance. No refunds on private lessons. For cancellation a minimum of 24 hours notice is required to reschedule, based on availability. * Hours for privates and semi-privates: 10 am, 11:15 am, 1 pm and 2:15 pm. The easiest way to ruin a beautiful day on the slopes is to not dress warm enough. 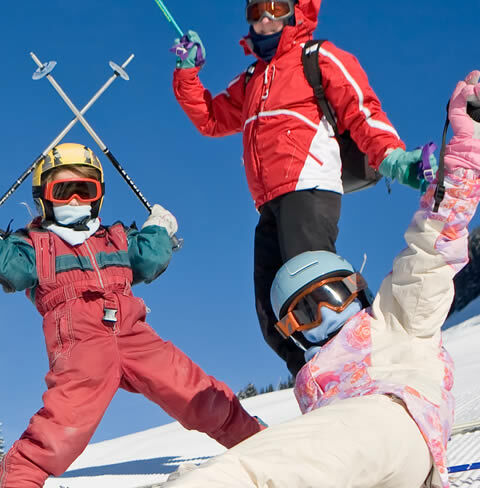 Take a look at our guide on how to dress your child for a day at Mont Ste-Marie, so they can enjoy the mountain all day without getting cold.